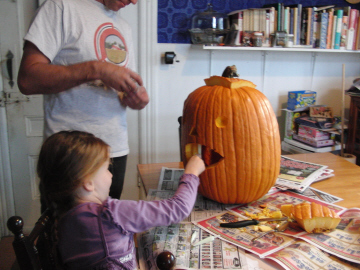 Ella and Daddy got to work on her pumpkin Sunday. Daddy had been saving a great pumpkin out in the pumpkin patch. 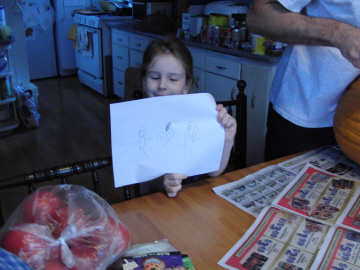 Ella drew up her plans. This is the only action shot. Ella decided the insides were too gross so good Daddy cleaned the guts out for her. Ella then marked out her face and Daddy did all the cutting. 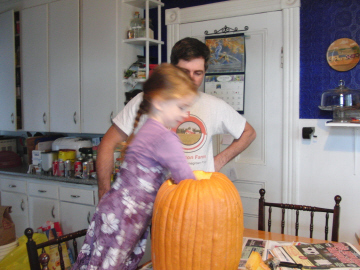 It’s a good thing Daddy was home because the pumpkin was so thick, I’m not sure I could have done the cutting. 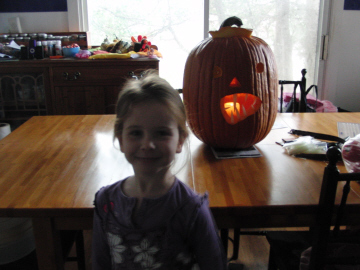 Sticking in the scary pumpkin teeth! Very pleased with her creation. As I mentioned yesterday, Ella is coming down with another cold. She was so miserable Sunday night. We actually spent the night downstairs. Luckily she perked up by Monday afternoon. 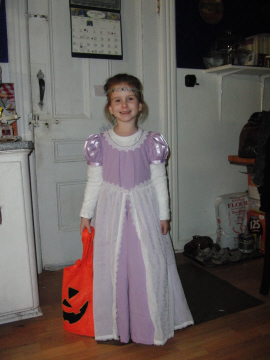 Ella as Rapunzel (from Tangled). I have the best Mommy. I have been so exhausted with this pneumonia, it’s been hard to do anything. I didn’t have a clue how I was ever going to make Ella’s costume this year. So my Mommy offered to do the sewing if I cut the pieces out. She did a great job. Thanks Mom!! on November 1, 2011 at 4:29 pm | Reply Candy C.